I worry constantly about brain drain over the summer. We signed up for Mathnasium math tutoring for my son this summer, and I can’t wait to share my experience with you. I received two months complimentary tuition for my son in exchange for sharing my honest experience. In the past, my kids have done a math book every summer on the recommendation of our school principal. The 10-15 minutes we spent each day definitely helped retain some material, but they still score lower on MAPS tests each fall than they did in the spring. With my son starting high school in just one more year, I need him to not slide this summer. When I had the opportunity to connect with Mathnasium in Palatine, I jumped at the chance. I know many friends who’ve had their kids do weekly math tutoring with Mathnasium since kindergarten. We hadn’t signed up previously, but based on our current experience, this will work out far better than the math books we’ve used in the past. I went to our first assessment with Mathnasium with a basic understanding, but I learned so much more that afternoon – and in the two weeks he’s attended summer math tutoring – that I wish I’d known about Mathnasium years ago. 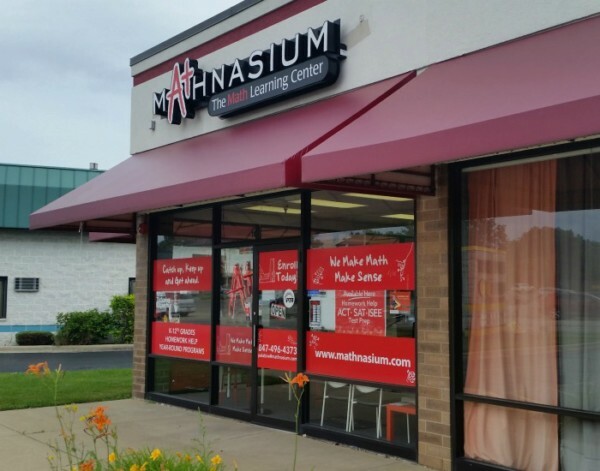 If you don’t live near Palatine, visit one of the 40+ Mathnasium Centers throughout Chicagoland near you for your own summer math help. Summer math tutoring isn’t just for elementary kids. When I first heard about Mathnasium, I assumed they focused on kindergarten to fifth grade or so. My son just finished seventh grade, and they offer math topics all the way through high school. Your children won’t “age out” of Mathnasium until they head to college. This allows a consistent path for your children to sustain knowledge and growth. The math tutoring at Mathnasium doesn’t focus only on struggling students. My son tested into the gifted program in our school district. When I first inquired about the summer math sessions, I didn’t know which child would fit best. 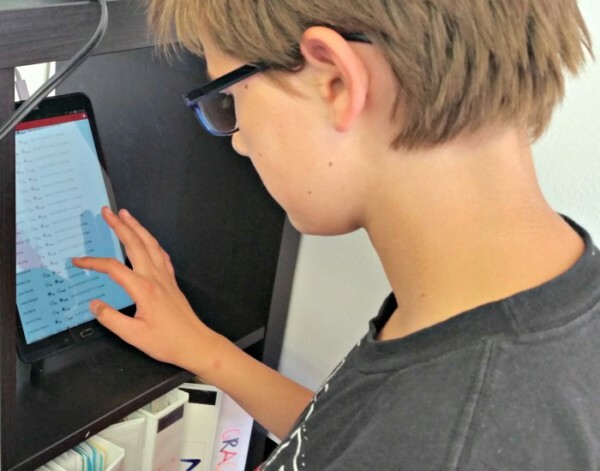 Mathnasium can handle children on both sides of the spectrum – those who find math comes easily and need a little stretch and those who struggle with math. Even though my son is in the highest level of math for his grade, that doesn’t mean he always absorbs or retains the skills – or that he gives his best effort to ensure he truly learned each topic. Mathnasium’s summer program helps ensure that your child absorbs skills he missed in the last school year. The math topics focus on his specific skills and move at his pace – more on that below. Mathnasium isn’t age or grade based – it finds your students’ gaps. When we came to Mathnasium the first time, my son took an assessment that lasted approximately an hour. We spent a little time with the Palatine Mathnasium director discussing what he learned in school the past year to determine the appropriate test for him to take. She reassured him that if he didn’t remember something, he could skip it but to try problems he thought he could do and just circle the ones he didn’t remember. I received the results of the assessment via email within hours of arriving home. Since this was a paper assessment, I assumed it would take a few days. Instead, I got a summary that showed the percent my son correctly answered by topic, as well as a customized learning plan and topics they planned to cover over the next two months. I had the opportunity to share what topics I felt were most important (e.g., some that he hadn’t learned yet versus some I was shocked he didn’t know) to create the topics he’d start learning at his next session. Your child works at his individual pace. In school, the teacher has a lesson plan and a set of skills to cover over the course of a year. If a child struggles or misses a concept, the class needs to move on. At Mathnasium, the curriculum is designed to uncover those gaps your child has developed over the years and fill them in with solid knowledge. Because they focus on learning as a concept and skill rather than needing to complete a certain number of lessons in a certain amount of time, that allows your child to spend the full session (or even more than one session) on a particularly challenging set of concepts. However, if your child readily grasps a particular aspect being taught, he can quickly show mastery of the topic and move on. Regardless of the speed with which a child masters topics, the focus remains on mastery. Mathnasium lets each child learn at his own pace. With the instructional design, the instructor quickly identifies when a student applies lessons incorrectly. The instructor then reteaches in a different way before child internalizes the incorrect process too deeply. The instructor works in small groups, with up to three children at a time. Depending on how busy Mathnasium is during your student’s time, the instructors may have up to three students they work with. The small group allows plenty of time for the instructor to teach (or reteach) math concepts to children while others put into practice what they just learned. This works because the instructor gives individual instruction to each child on the topic he’s working on at the time. For a few minutes, the instructor teaches, then the child focuses on applying those lessons while the instructor works with the next child, and so on. The mini lessons break down the concepts further and allow children to put them into practice more quickly, increasing their retention. The groups are not created by grade or topic. My first visit to Mathnasium included a world of assumptions that proved inaccurate. I pictured sessions where all the fifth graders sat together or all the middle schoolers sat together. Instead, the children simply work with available instructors. In fact, Mathnasium doesn’t encourage similar grades near each other because what one fifth grader works on may be completely different from his neighbor. This reduces a feeling of inadequacy when a student doesn’t grasp a topic immediately and eliminates the sense of competition some may feel. Your child may or may not have the same instructor each session. I initially assumed that Mathnasium assigned a single instructor to my son, and that’s who he would work with each session. Instead, each session he can choose from available instructors. As long as the instructor has room for another student, he can choose his “favorite” instructor or try someone new. Until I better understood the Mathnasium method, I didn’t see how this would work, but it does. 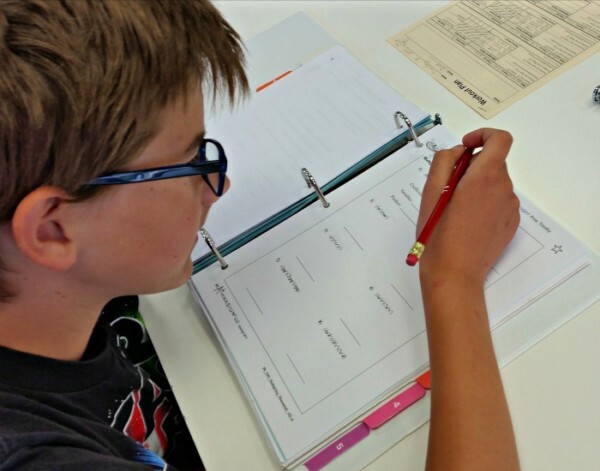 When a student arrives, he picks up his binder from the shelf and selects and instructor. The instructor opens the binder for the first section and immediately sees what the student is working on. He can give an overview lesson or let the student begin working, depending on the need. 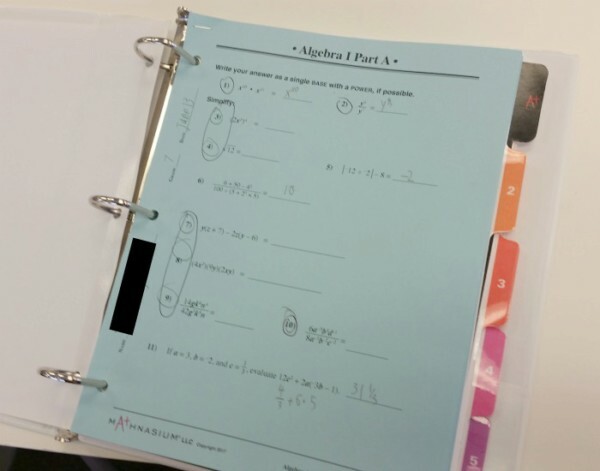 As the student completes each lesson, that printed page of work moves to a different section of the binder. The start of that first binder section always has the current topic first, which allows any instructor to work with any child effectively. The instructors go through a rigorous set of testing to determine their qualifications to teach. I don’t know quite what I expected from the instructors other than that they would know their material. I expected some to focus on elementary math while others taught high level maths. Generally, the instructors teach all levels – sometimes at the same time. For advanced topics, there is some specialization. Each instructor undergoes rigorous testing to ensure they have mastered a variety of math skills. Many instructors are also local teachers, all with strong math backgrounds. Simply knowing math isn’t enough, however. Mathnasium focuses on those with a love for math who have a talent for spreading both that love and their knowledge with students. You sense that enthusiasm from the moment you walk in the door as you hear the instructors explaining concepts and encouraging students. Students move at their own pace through lessons. The assessment helps instructors know what lessons each child needs. Some children grasp some topics readily while others take longer to master. Students don’t have a set number of skills they need to learn each session. This removes pressure from school to learn a topic at the same speed as the remainder of the class. On the flip side, if a child finds that a skills comes quickly, he can ask to take the skill assessment without completing all pages in the lesson. If he successfully completes this, he can move to the next set of topics. That ensures that the child moves at the pace best suited for his individual needs. The instructors also note and sense relative mastery of topics and slow or speed their teaching to fit each child’s needs on that individual topic. Just because my son did well on Topic A doesn’t mean he’ll grasp Topic B as quickly. Mathnasium provides incentives for completing and mastering topics to encourage kids to work hard. For each lesson children complete, they earn a punch on a motivational card. Each card includes 24 stars to earn. They can choose to save up completed cards for larger prizes or spend them on smaller prizes. The prizes fit a variety of ages and interest so that my middle schooler remains as motivated as a kindergartner. If a child doesn’t work as hard, he won’t earn as many stickers. This helps avoid students sliding through the math tutoring and instead encourages them to work their hardest. 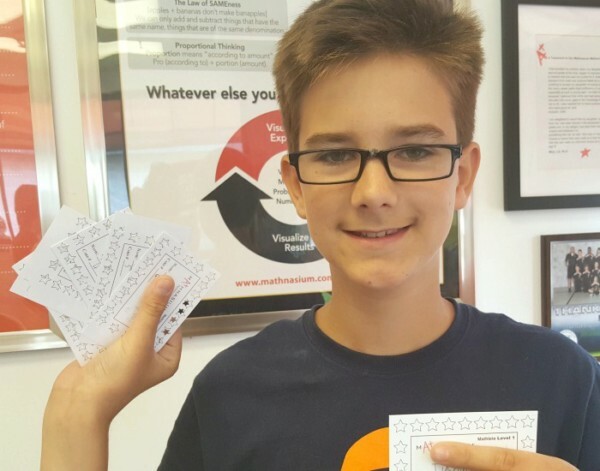 My son earned many stickers his first session, as the skills they started with were ones he quickly remembered and mastered from this past school year – though he hadn’t done well with them on his assessment. His instructor carefully reminded him that he wouldn’t earn this many in general. I appreciated the reminder that set the right tone and expectations for my son. This helps avoid disappointment or frustration in future sessions. The sessions include approximately 45 minutes focus on new topics and the remaining time on skill building. I’ll admit that I didn’t really think about how Mathnasium designs the instruction period until our assessment. Rather than spending an hour learning new concepts – longer than most students spend on math during school and potentially losing their focus – students spend the first 45 minutes or so working on new skills or catching up on work they didn’t understand from school. The last fifteen minutes focuses on critical thinking exercises and problem solving. This tends to be fun while still focused on learning and building on skills for your child. These skills vary, but they reaffirm the math is fun focus. That philosophy sets Mathnasium apart from so many other methods and math tutoring centers. Parents do not need to stay for each session. I’ll admit, I stuck around for the first session. I wanted to hear what my son worked on and how he reacted to the lessons. I was pleasantly surprised to hear the instructor reminding my son to show his work, to erase instead of writing over mistakes, and to not skip steps. Interestingly, he listened (we’ve been telling him the same things for years to no avail). Though other students came and left during my son’s hour, I was the only parent who stayed for the session. Some parents brought their kids in and ensured they started the session. Others simply dropped their kids off and let them enter and sign in themselves. Most parents returned at the end of the hour to pick up kids, which is how we handle it. He knows how to sign in when he arrives using the simple system. If you choose to wait, there are some seats, but the design is intended for students to work. Fortunately, Mathnasium is local and just five minutes down the road from my house. I now drop him off and either run errands or scoot home to work while my son gets schooled in math, then return to pick him up once his math tutoring ends. What happens next with Mathnasium? My son attends sessions twice a week. At the Palatine Mathnasium location, they’re open from 2pm to 6pm Mondays, Tuesdays, and Thursdays, plus 9:30 am to 1pm Wednesdays and Fridays for your children. If your child needs private tutoring, you can arrange earlier sessions, as well. The school year times obviously run differently and also include Saturday hours. After his two months working with Mathnasium, he’ll take another assessment. This helps determine how much he learned and truly measures his progress. All students regularly take assessments to gauge overall learning. The focus on results is one aspect I truly love so far about Mathnasium. I fully expect that he will grow significantly, as I can already see some skills he’s mastering. Best of all, he’s enjoying it. My son is 13. When I told him I signed him up for summer math tutoring, he wasn’t thrilled. After his first session, he came out smiling and talking about what he learned. My son has yet to complain, and he’s excited about saving up his rewards for a “big prize” as he puts it. Summer isn’t even close to over. It’s not too late to sign your child up for Mathnasium. Simply call 847-496-4373 to set up an assessment, as you can start at any time. I’m sure you won’t regret it! Has your child done summer math tutoring to avoid summer brain drain? How did it work? Ready to learn more? Call Mathnasium in Palatine to schedule your child’s assessment, as math tutoring sessions start any time you and your child are ready. Reach them at 847-496-4373. You can also find them on Facebook. Check out what we learned after 2 months to see how our summer learning sessions succeeded with my stubborn child!